Ma Yingying is the Green Supply Chain Project Manager for the Institute of Public & Environmental Affairs (IPE). She conducts environment related research, management and consulting on water and climate for universities, enterprises as well as government agencies. Ma Yingying holds a bachelor degree in Science Geochemistry from Peking University and a master degree of Environmental Economics and Management from University of Montesquieu-Bordeaux IV. The Ministry of Environmental Protection (MEP) has been tightening & introducing various new stringent industrial wastewater discharge standards over the last few years. Factories will have to comply with some of these standards this year. However, in November 2014, the MEP proposed to revise the standard for the textile sector, by relaxing the indirect discharge standard for wastewater discharged to treatment facilities in industrial parks. Some industry insiders believe the proposed amendment is the result of lobbying efforts by textile enterprises & associations as the cost of implementing and operating wastewater treatment equipment per factory can be prohibitive. On the other hand, others like Professor Xi Danli from Donghua University believe the amendment is necessary as the previous standards were too strict, making it almost impossible not to violate the standards. Regardless, the relaxation should encourage more centralised treatment, which in theory could reduce pollution as smaller discharging enterprises will not have the same treatment capacity as centralised facilities. At the same time, this should also reduce the incentive to illegal discharge. Although this draft amendment is currently undergoing public consultation, NGOs and experts have raised concerns over the capability of these frequently over-utilised centralised treatment systems to deal with the additional load. Their concerns are justified. 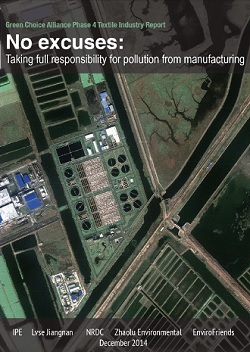 A recent report, “No excuses: Taking full responsibility for pollution from manufacturing”, highlighted an average of 1.4 violations per wastewater treatment facility between 2008 & June 2013 recorded by Institute of Public & Environmental Affairs’ (IPE) China Water Pollution Map. The report by IPE, Lvse Jiangnan, Natural Resources Defense Council (NRDC), Zhaolu Environmental Protection and Commonweal Service Center, warns that “many centralized treatment systems in China are already severely overloaded or operating in a way that does not sufficiently treat the wastewaters they received”. It particularly highlights “serious problems” with current centralised treatment facilities for that treat printing and dyeing wastewater. 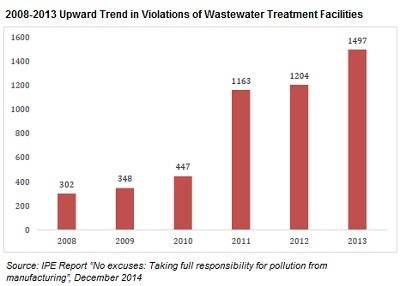 With violations records of wastewater treatment plants rising, it is clear that risks are shifting beyond the factory wall. As the government continues to push the “war on pollution”, it will be less easy to hide behind unaccountable mechanisms to directly/indirectly discharge above the standard or permitted levels. Do brands now need to include centralised treatment plants in their supply chain audits? 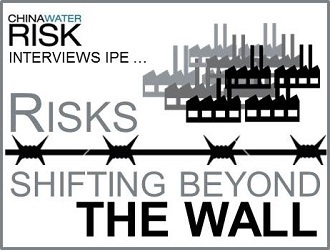 China Water Risk interviewed IPE’s Green Supply Chain Project Manager, Ma Yingying (MYY) to find out more about key challenges in managing this shift in risk – topics discussed range from unaccountable mechanisms between parties, limited transparency, ineffective monitoring to technological limitations. What can brands and manufacturers do? China Water Risk(CWR): Is centralised treatment an effective treatment method for China’s textile wastewater? MYY: Our survey suggests parts of centralised printing and dyeing wastewater treatment has serious problems and so should not be considered a cure-all. These problems lie in: 1) vague responsibilities between enterprises generating wastewater and wastewater treatment companies, 2) lack of effective supervision and management on pre-treatment by factories, which leads to excessive discharge by centralised plants, and 3) lack of effective supervision and treatment at the centralised treatment plants. As a result, centralised treatment brings centralised pollution. CWR: Can you elaborate on the main causes of “centralised pollution”? Technology is the other cause. Current centralised wastewater pre-treatment plants are mostly municipal wastewater treatment plants. Without cooperation from the factories for upgrading technology, the plants can hardly ensure adequate treatment of the pollutants. Without these upgrades there centralised treatment can actually have negative effects such as an increase in the amount of sludge, according to a partner NGO. CWR: According to the report, once the discharged wastewater enters the centralised facility the data monitoring ceases. Should we be worried? MYY: In the past, we could trace discharging data of every enterprise and wastewater treatment plant but now only the centralised facility’s discharging data is available. Theoretically, enterprise discharging data should be able to remain public with the help of technology. It all depends on the willingness of the enterprise – are they willing to publish the data? As for data from the treatment plants, we can’t find any. CWR: The report shows that pressure from brands & customers can instigate change in the right direction, like the Saintyear Holding Group Company that now rents a wastewater treatment facility to pre-treat its discharge. Can this model be extended to other factories? MYY: We believe that “pre-treatment” can be carried out widely but to rent a wastewater treatment plant is not easy promote. 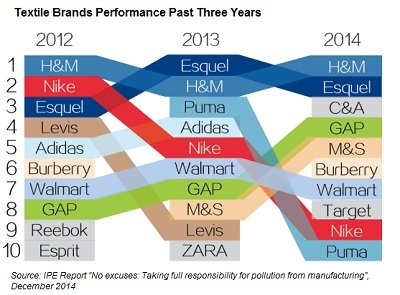 Saintyear’s case is rather special because it was being pressured by brands like Uniqlo and GAP to reduce its pollution. All companies and factories have different circumstances but nevertheless we encourage them to propose solutions in line with their situation. It is important that every solution include a clear public commitment on pre-treatment responsibility. In that sense, Saintyear is ahead of the pack with its public commitment to upgrade the wastewater treatment plant it rents to meet discharge standards. CWR: What’s the best practice for centralised wastewater discharge? The report outlines practice in the US, is it applicable to China? MYY: Our report partner, NRDC has a strong US focus. The US government passed the “Clean Water Act” in 1972, which included a provision for mandatory pre-treatment and another for waste discharge permit application. Moreover, enterprises that use centralised treatment as well as all centralised treatment plants need to make their treatment standards & their discharges open to the public. The rights and obligations of those discharging and those treating wastewater in a centralised treatment models are as follows: enterprises generating pollution should send wastewater to the wastewater treatment company that adheres to contractually agreed pre-treatment standards. Centralised wastewater treatment companies should treat wastewater sent to them by the discharging enterprise in accordance with a pre-arrange fee level. We suggest in the report that the Chinese government, textile enterprises and brands work together to improve accountability in the wastewater treatment system. One simple example here is for enterprises to publish their self-monitored data to help identify responsibility. In Jiangsu province, we have seen enterprises moving towards this referred to as “one enterprise, one monitoring”, which will enhance regulations on every enterprise that contributes to centralised treatment. CWR: The China National Textile and Apparel Council (CNTAC) has been working with the Ministry of Industry and Information Technology to carry out an “ecological plan” for the textile industry. The plan aims to reduce waste discharge by improving technology and design of workflows such as: front-end reduction of wastewater and wastewater treatment based on the amount of pollutants etc… What are the key challenges here? MYY: We believe the key obstacles are the lack of motivation, lax supervision, low water price and the lack of brands with green supply chains. CWR: The report recommends brands to incorporate “pre-treatment” into their operations. Do you think they will do so? MYY: Our discussions with brands suggest they are willing to include wastewater pre-treatment in their supply chain management. For now, brands are urging enterprises to comply with local environmental standards as it is easier for them to do that than manage a wastewater treatment plant themselves. The next step for brands is to pressure the wastewater treatment plants. Our past experience shows that when brands encourage enterprises to increase investment in environmental protection they are more motivated to do so. Moreover, brands can also apply pressure regarding hazardous chemicals and long-term investment. To accelerate the adoption of these brands can also help enterprises with financial incentives. In our work with brands we have also found that these actions are not causing additional burden to brands, since it’s part of their Corporate Social Responsibility programmes. Some international brands have made great effort as well as some domestic enterprises, such as Li-Ning. CWR: We have seen growing government pressure on the textile industry regarding the environment. Will this cause the textile industry to move out of China? MYY: Increasing labour costs will lead to a shift in garment sectors. However, the printing and dyeing sector is a technology and capital-intensive industry. This means that some big brands will keep their operations in China because of the higher level of technology. When completing IPE’s Pollutant Release and Transfer Register (PRTR) some brands proposed to include their suppliers in Southeast Asia. We agree that this would be beneficial. If brands can apply uniform requirements on its global suppliers, a new round of pollution transfer could be avoided. With that wish, we hope our PRTR platform can expand internationally so that more enterprises can enjoy fair market competition. By doing so, we can promote global sustainable development of the textile industry.